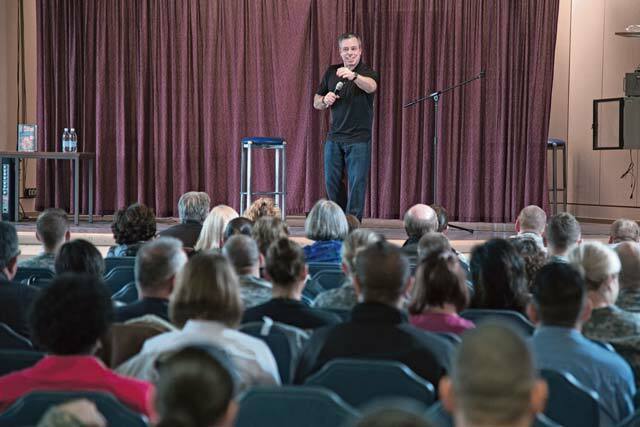 Comedian Bernie McGrenahan performed his “Happy Hour — Comedy is the Cure” show for Stuttgart audiences at the Patch Community Club and Kelley Theatre April 18, providing comedic relief and Army Substance Abuse Program training all at the same time. members. The program was sponsored by U.S. Army Garrison Stuttgart’s Army Substance Abuse Program. “The combination of humor and a story helps get the message across. It impacts the audience better than some other methods of training, like PowerPoint,” McGrenahan said. Part of his motivation in sharing these personal stories is to reach out and help service members and others in military communities cope with the many challenges they face. The performance was deeply engaging and definitely stirred responses from the audience members, some of whom were in tears. According to McGrenahan, he usually receives very personal emails after the shows from service members or others who were touched by the performance. 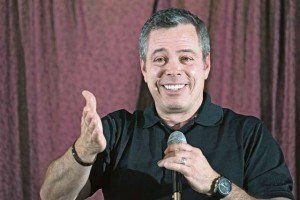 Comedian Bernie McGrenahan performs his “Happy Hour — Comedy is the Cure” show for Stuttgart audiences at the Patch Community Club April 18, providing comedic relief and mandatory Army Substance Abuse Prevention training. The performances were part of McGrenahan’s 2014 European tour, which also included shows at Baumholder, Ramstein, Wiesbaden, Ansbach and in Belgium. The Stuttgart shows were the highlight of U.S. Army Garrison Stuttgart’s Army Substance Abuse Program observance of National Alcohol Awareness Month. ASAP’s other activities included outreach and education efforts at the Panzer Exchange April 22-24 and other events in the Stuttgart area.